Asparagus season at our local farm market came to a close last week. Sigh. We nearly had our fill. But we’re not complaining (trying not to, anyway). Now the market’s bins are full of the sweetest strawberries, fat unblemished English peas, bunches of radishes, and spring bulb onions. So we made ourselves a quintessential spring lunch today: radishes with butter and sea salt, sucky peas (thank you Niloufer Ichiporia King! 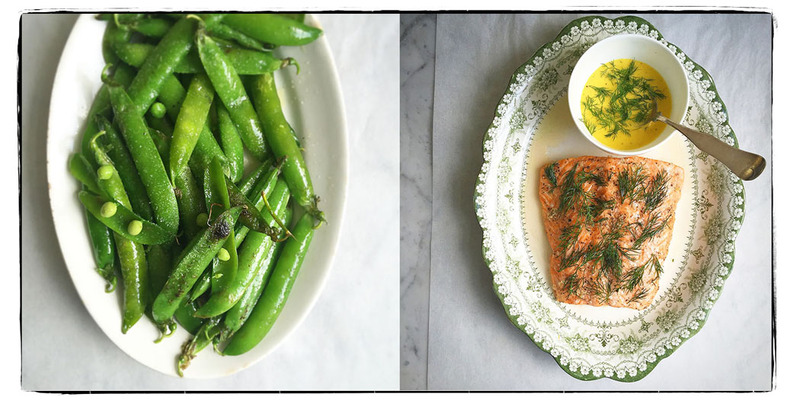 ), dill-roasted salmon with our Canal House lemon-butter sauce, and poached onions. Strawberries for dessert. And glasses of rosé to wash everything down.